-SG- Respected professional photographer Don Morley has written various motorcycle books including one on Nortons. His Moore CS1 - which he no longer owns - has been pictured in various of them and I attach a print of it dating from around 1980. It is, dare I say it, a 'typical of the period' restoration with some over-plating, the wrong carb., wrong magneto, and from what little I can see, an incorrect gearbox. 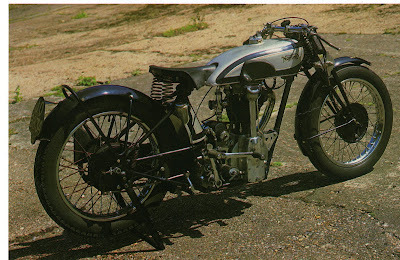 However, what may be important, if correct, is that Morley states it is actually Woods' 1927 works machine on which he achieved a record lap in the '27 TT. The registration number appears to be JO 8834 (issued from Jne. 1930 to Apr. 1934 by Oxford Council). I feel this suggestion is doubtful, if for no other reasons than that the timing cover of this machine is of the regular CS1 production machine shape, and that the late 1927 road test of a CS1 with another registration number OP8644 (issued from Aug. 1926 to July 1927 by Birmingham Council), is stated as being the TT lap record holder as well as winner of the Swiss GP. It would be interesting to have frame and engine numbers to check it out, especially as I have not, hitherto, been able to find entries in the records for the 1927 works CS1s or ES2s.